Many enterprises have leveraged the correlation, visualization and case management of SIEM to drive the workflow of their Security Operations Center and much of the daily activity of the security team. With the introduction of big data scale, machine learning-based analytics and instantly-accessible forensic data, Network and User Behavior Analytics is a terrific complement to SIEM. Intel and Niara will explain how these new capabilities can be seamlessly introduced to SIEM and demonstrate both enhanced attack detection as well as accelerated investigations and response directly from the McAfee Enterprise Service Management (ESM) console. Security and risk professionals are dealing with staggering amounts of endpoint-related data loss and risk exposure. To mitigate these risks, security pros need to rethink their current endpoint security strategies and focus on getting the basic foundations in place on the endpoint. Join guest speaker Chris Sherman, Analyst at Forrester Research, as he discusses Forrester’s "Targeted-Attack Hierarchy of Needs”. Chris will highlight the core endpoint security needs critical to an enterprise security strategy. Hosted by Intel Security and its Security Innovation Alliance partner Avecto, this webinar will provide practical advice on how to build a smart and simple strategy that fits with your existing McAfee ePO infrastructure. Sharing real world examples and data, this session will provide a clear and jargon-free overview of today’s security landscape, demonstrating proactive security that stops cyber attacks. Many enterprise organizations are moving beyond antivirus software, adding new types of controls and monitoring tools to improve incident prevention, detection, and response on their endpoints. Unfortunately, some of these firms are doing so by adding tactical technologies that offering incremental benefits only. A strategic approach that covers the entire ESG endpoint security continuum from threat prevention to incident response. A truly comprehensive solution will also include advanced endpoint security controls that reduce the attack surface and tight integration with network security, SIEM, and threat intelligence to improve threat detection and response processes. Join ESG senior principal analyst Jon Oltsik, Intel Security, and Bufferzone on a webinar on July 21 at 10am PT/1pm ET to learn more about next-generation endpoint security requirements and strategies. Michael Rothschild, Sr. Mgr Product & Alliances Mkting and Analyst Enterprise Management Assoc. By now, we all recognize the need of securing our data against the inevitable breach – but in doing so, is the business being put at risk in other ways? Often times putting security in place means the IT and security departments having to take a lot of time to learn, deploy, fine-tune and monitor the solution, effectively ‘back-burnering” initiatives that can drive the business forward. This can ultimately costs the business money. What security makes sense and is there a way to make it transparent to the IT and security manager? With more data in more places being more critical than ever, is it possible to deploy effective security that leverages and works in conjunction with your existing environment AND provides a great user experience for IT and the business? Join us for this Intel Security/Vormetric webcast where Analyst, EMA, will frame this increasing problem that often pits the business & IT folks against each other. Gain real knowledge into the issues confronting both, as well as real ways to solve some of the most daunting security issues without hitting the speedbumps to the business. The use of cloud applications to share, collaborate, and store data has grown drastically. Learn how employees can safely utilize cloud services such as Office365, Box, Dropbox, Google Drive, etc. See how a solution from Intel Security can provide encrypted file security for PCs, cloud, and mobile devices while preserving the end user experience. There however is a structured and methodical way to approach these threats by coordinating comprehensive database and file security with proactive threat analytics and complete end-to-end forensics which can significantly mitigate data breach risks without breaking the bank. Join 451 Research, Intel Security, & Vormetric for an enlightening webinar where you will be briefed on the current state of the data threat and the right methodology to secure your data and your organization. For years, most endpoint security strategies have revolved around endpoint anti-virus, but this approach is clearly unable to keep pace with modern threats. To mitigate their risks, IT organizations need to rethink their current endpoint security strategies and move past these reactive security technologies. In order to set organizations down the right path, we will present Forrester’s five design principles of an effective endpoint security strategy, helping security professionals to place attack surface reduction and tool integration as their central focus points within their own strategies. Ultimately, this will allow organizations to better deal with the influx of new device types and data access requirements while reducing the likelihood of data breaches. Attend this webcast to see how endpoint encryption can keep your data safe. Learn the differences between the traditional enterprise-grade drive encryption and the native encryption that is provided by the OS vendors; BitLocker for Windows and FileVault for Macs. The webcast will help you decide which encryption method is best for your business and which data protection solution will fulfill your needs. Organizations need to be more business-centric in their approach if data loss prevention is to be successful. By supplying McAfee Data Loss Prevention (DLP) with reliable insight into the meaning and value of data, Classifier complements the detection methods based on keywords and regular expressions alone, helping reduce the risk of data- loss. The combination of Boldon James Classifier and McAfee DLP reduces the likelihood of data loss by providing the DLP solution with predictable, meaningful classification metadata that greatly improves the reliability of DLP decision making, improves system effectiveness and reduces false positives. As enterprises struggle to control and secure their assets across internal file stores, an ever-increasing universe of mobile devices, and a plethora of non-secure cloud storage services, they are searching for solutions that allow them to quickly identify and isolate noncompliant data sharing and prevent unauthorized access to sensitive information. Intel Security and Topia Technology have partnered to develop an integrated product for organizations to store, analyze and share documents from a mobile device or a cloud computing platform. •Secrata deployed with McAfee provides a unified file sync and share experience with military-grade security, to address this need. •McAfee Enterprise Security Manager enables businesses with true, real-time situational awareness and the speed and scale required to identify critical threats, respond intelligently, and ensure continuous compliance monitoring. Would you ever consider leaving your house for the day without locking your door? Of course not!! It is as important to protect and control front-door access of your databases as it is to lock the front door of your house. That is why we use a suite of database discovery and activity monitoring tools to control the front door access of our databases. Yet hackers and miscreant insiders know that the back door of databases are all too often left wide open—and it is the path of least resistance to steal valuable data. Vormetric has partnered with Intel Security to integrate with McAfee Database Activity Monitoring (DAM) and McAfee Enterprise Security Manager (ESM) to extend data-security coverage. Vormetric adds another layer of security to McAfee DAM by preventing unauthorized users and processes from accessing or viewing the database files through transparent encryption. Attend this webcast to learn about best practices for managing the native encryption for Macs (Apple FileVault) and for Windows based PCs (Microsoft BitLocker). The webinar will highlight functional aspects of McAfee Management of Native Encryption software. Cyber attacks frequently progress through a number of stages. Understanding each stage of an attack and the potential disruption points in the chain can assist IT security teams to better defend their networks. Join this webcast to look at today’s attacks relative to the stages of the cyber attack chain and discuss what defenses can mitigate each stage to help prevent an attack. McAfee Labs has followed a group of sophisticated actors who persistently and methodically attacked major global organizations for more than three years. This campaign involved a series of targeted attacks, primarily through email phishing, that resulted in the exfiltration of sensitive government data. 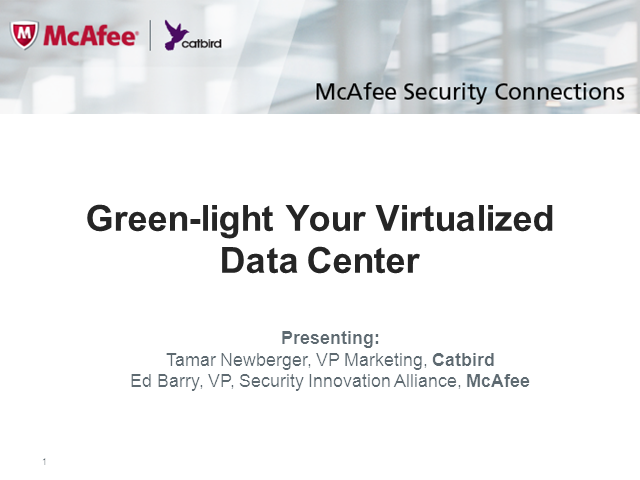 In this webcast, McAfee principal security researcher Ryan Sherstobitoff provides an in-depth look at the Archangel cyber-espionage campaign and give recommendations on how to prevent similar attacks from impacting your organization. Microsoft Office 365 enables customers to work in the office or on the go, with the idea of enabling businesses to run more effectively. Yet, phishing tactics are increasingly sophisticated. As organizations consider moving email infrastructure to Exchange Online, is there a need to complement built-in security with additional solutions? Join this session to learn how advanced threats are being delivered, and how McAfee uniquely extends critical protection to organizations using Office 365 for email. A free offer to run an assessment of your organization’s ability to detect phishing will also be provided. The Enterprises today want secure, highly resilient and high bandwidth WAN connectivity. But to accomplish this, can be expensive, time consuming and can affect the overall end-user experience. Find out how augmented VPN capability can give you more control over usage while lowering costs and keeping end user satisfaction high. Join Steve Smith, Senior Technical Manager at Intel Security, as he explores the latest advances in VPN technologies, including augmented VPN, bandwidth aggregation, quality of service techniques, and building redundancy. Plus, get a link to a VPN cost calculator to find out how much you can save over existing MPLS circuits. •Understand how McAfee’s IPS can help you solve the malware mystery. •See how an integrated IPS platform can break down data silos. •Learn the power of having all security context in one place. •Hear how to understand and block advanced malware in a matter of seconds.